Fabric “stash” might be a bit overstated as it amounts to one meager piece, but it is fabric after all, and I’m not finished with my shopping just yet (I’ll be begging for your help with that later in this post). 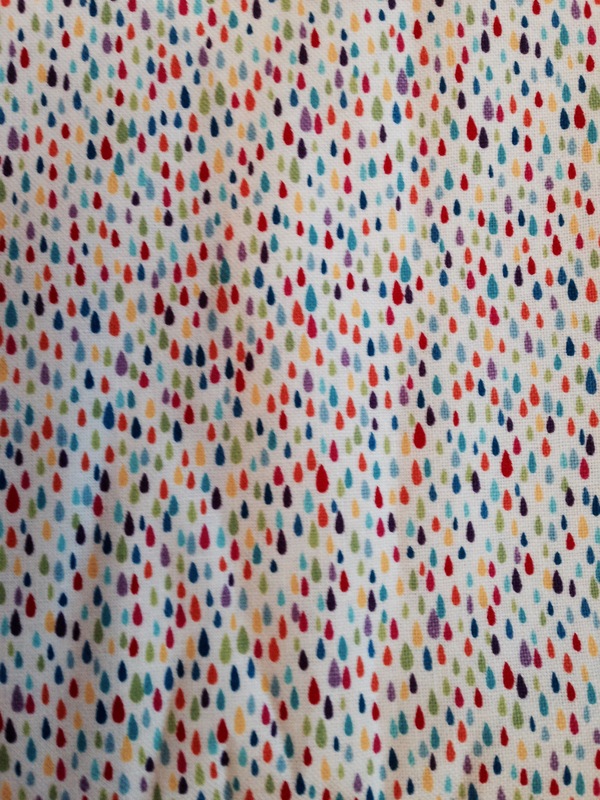 The fabric shops near me specialize in quilting, and mostly offer cotton choices, which is just what I need for ease of sewing and confidence building. Hopefully no one was paying too close attention when I missed last Sunday. We’ve had guests (fun times) and worked around the old house (work times) so I didn’t write much, and apparently everyone took photos but me. However, I do have a few random shots from around the house over the last couple of weeks. I’m calling today’s Sunday Sevens a mash-up. Doesn’t that make me sound so modern and hip? When my friend Kay was visiting from Las Vegas, one of our excursions was to the Corn Hill Festival. 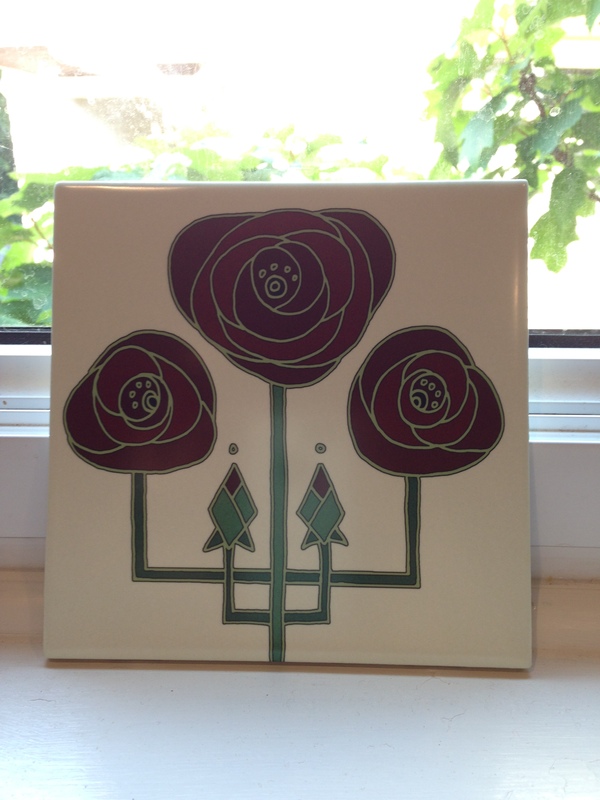 She bought me this Arts and Crafts inspired tile trivet as a memento, which is perfect in our kitchen. 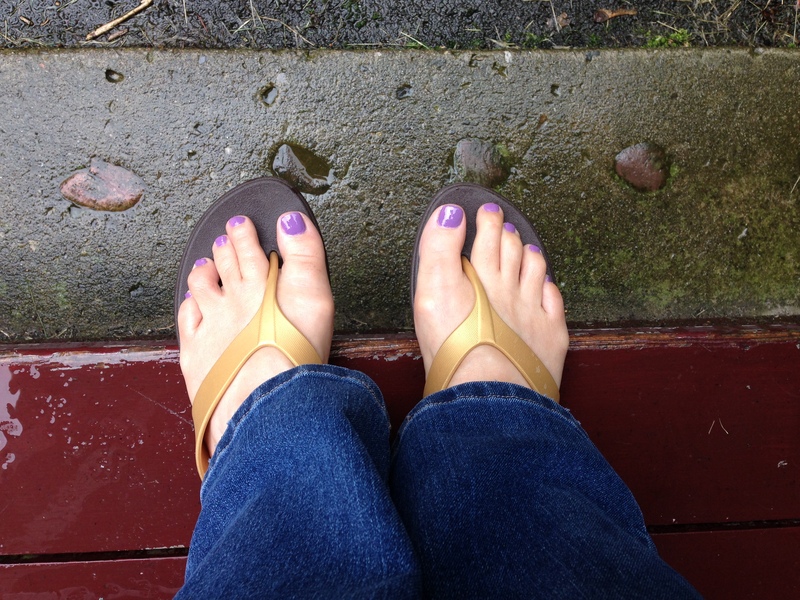 I have fancy new toes – and what better place to model them than on the back porch in the rain? 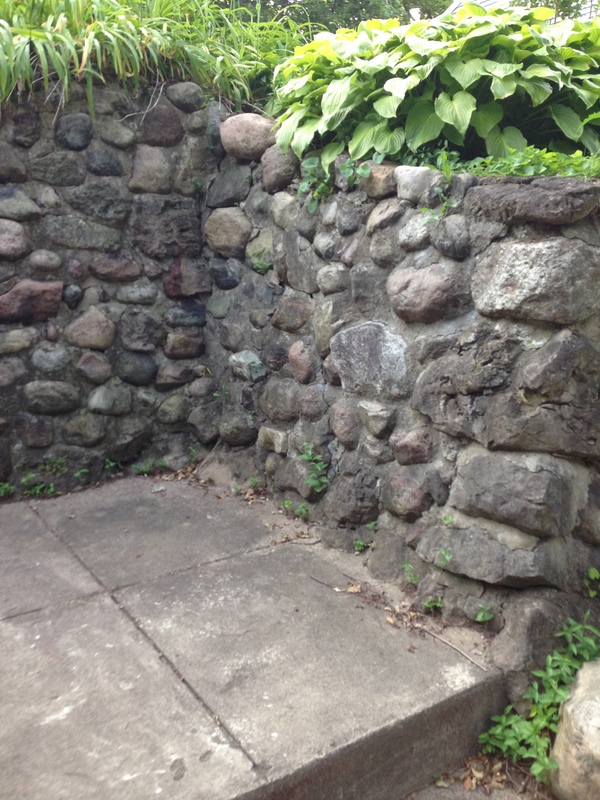 And I’ve been trying to stick to a walking routine….here is the gorgeous rock entry to a neighbor’s front walk. Speaking of gardens (who was speaking of gardens? 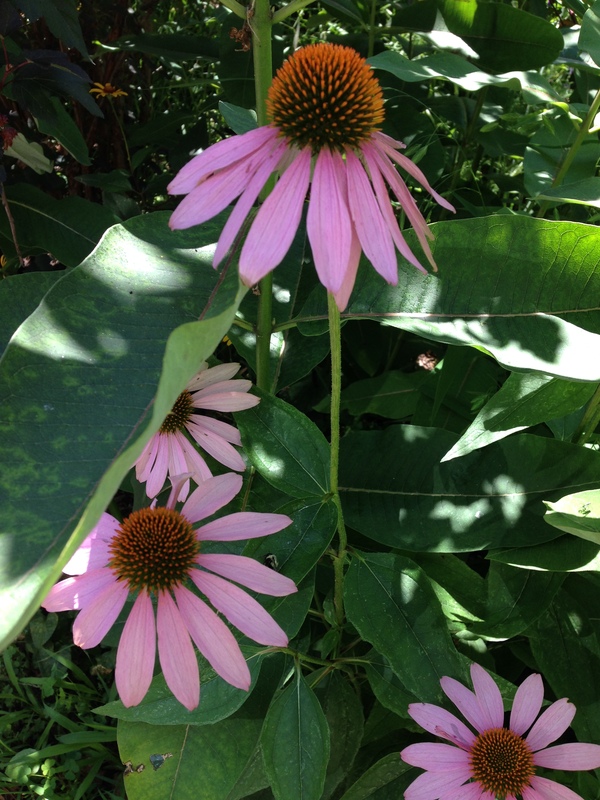 ), my planted-too-late sunflowers never took hold, but we have these Echinacea. 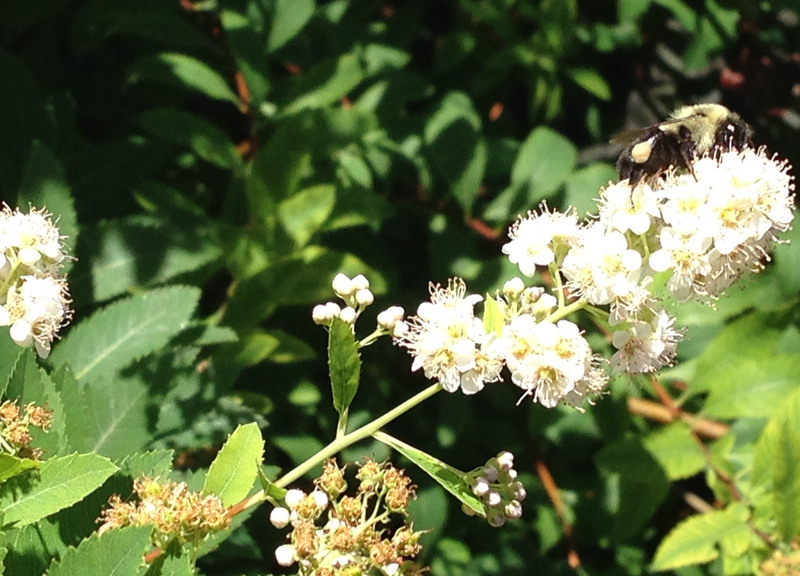 And I don’t know what these are, but the bees just love them. Can you spot one? 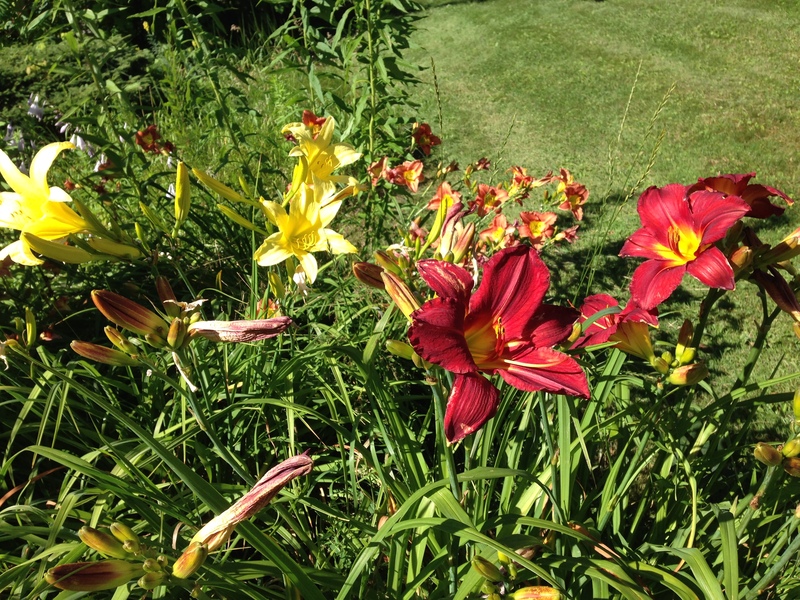 Lilies at our old house, need to plant some at the new house for next year. And who doesn’t love babies? 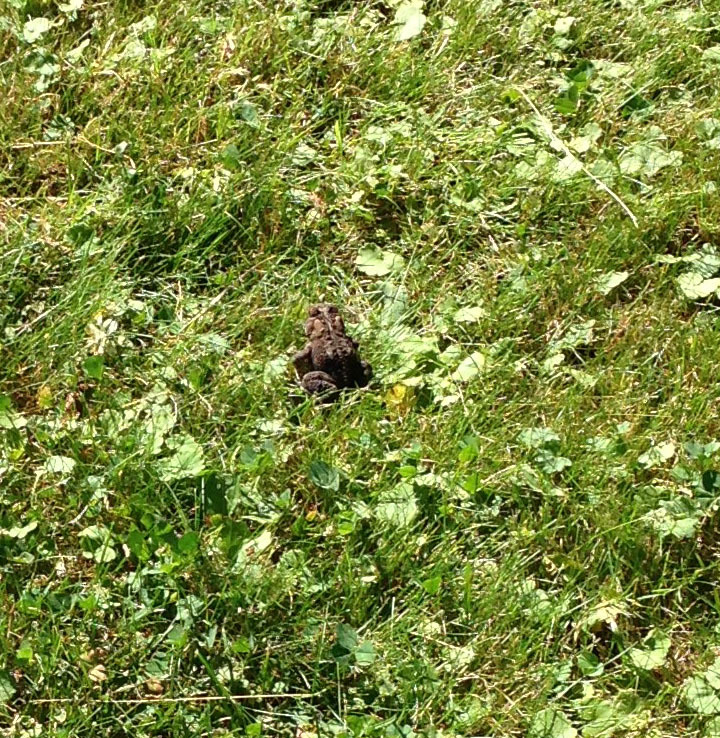 Look at this little guy (about 1-1/2 inches) who was just hopping around at the old house. Next week for me – fabric shopping, hooray! Happy Sunday everyone, hope your week brings nothing but goodness. Holy cow, I’ve won an Award! Well, would you look at this. 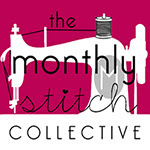 The lovely and very talented Lesley at https://lfkingsewing.wordpress.com/ sewing has just given me an Inspiring Blogger Award! As with most things, there are rules to follow, and this is me, following them in my own special way. ONE. Thank the blogger who nominated you. Lesley, I am sending the biggest Thank You! This has made my day, my week, my month, my two months of blogging. TWO. List the rules and display the award. My responses are contained within the rule list, and the award is proudly displayed at the beginning of today’s happy post. THREE. Share seven facts about yourself. 2. I used to sew, but stopped for over 40 years. Starting up again has been so much more slow-going than I anticipated, sigh. But I love it! And I love fabrics. I’m a tactile kind of person, and love to touch the fabrics (any surfaces, really) everywhere I go. They have to watch me very, very closely in museums. 3. Although neither of us knew it at the time, 20+ years ago I met the love of my life. Five years ago we started seeing each other and we married on May 7, 2011. (that’s all prime numbers, if you hadn’t noticed…pretty cool, yes?) Then I did the unspeakable and moved from CA to NY when he retired. 4. And as you probably suspected, yes, I miss my family in California every minute of every day. 5. I love anything to do with Wales (my mother’s homeland). 5a. I’m entirely too obsessed with my Welsh-ness. 6. 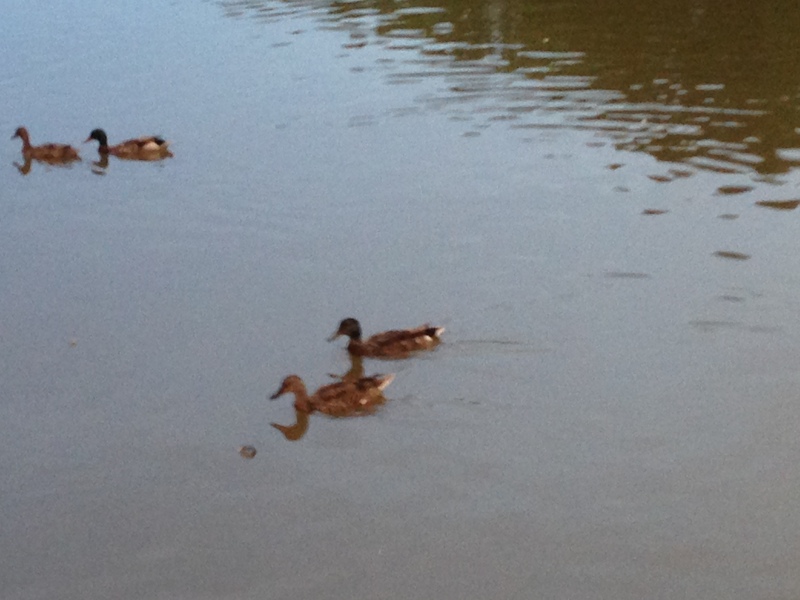 If only I could save all the animals……..and children……..and eliminate suffering……..
7. I’m very shy, and it took nearly 2 years before I mustered the courage to even start a blog. After reading so many, I couldn’t decide what mine would possibly be about. Sewing? But I didn’t have a sewing machine, at the time. Projects? What to do? How would they turn out? And then, who in the world would want to read it? Oh yes, so many worries. FOUR. Nominate other amazing blogs and comment on their blog to let them know you nominated them. Now, this is difficult part. I follow 62 blogs (on my blogroll, which only displays 50?) and others that are not even on the list. They include mostly sewing, but also fashion, food, lifestyle and writing blogs. 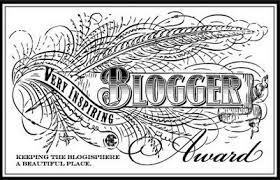 I carefully checked through “my” bloggers that are rather new, and found that almost all of them have already received such an award. Not to mention the long-time bloggers that have received multiples. So to my little band of faithful followers, you know who you are, and I thank all of you for your encouragement during my trials thus far. You’ve taught me much already, and cheered me on when my confidence was waning. I comment on many other blogs whose authors don’t know me from beans, and yet they respond back like we are old friends. This is a great community. Can I nominate everyone? But I must specifically mention two kind souls who made time to communicate with me through emails, and were instrumental in getting me to put my feet (or is that fingers) into the big scary world of blogging. So an extra thank you to Sarah of Goodbye Valentino, and Leslie of Hostess of the Humble Bungalow. Thanks again, Lesley, and happy sewing everyone! Good morning! 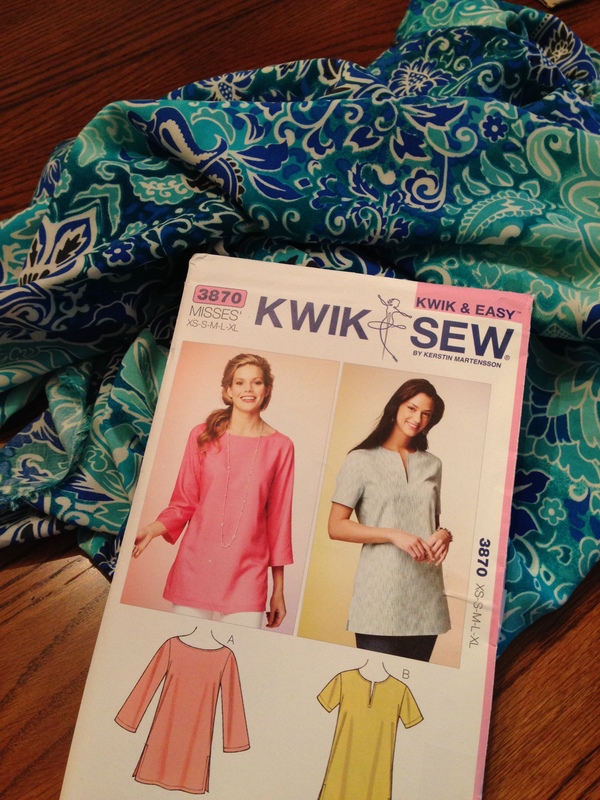 As you may recall, I lost the battle with the fabric on my first garment, the Kwik Sew 3870. It slid and shifted and left me a hemline unlike any I could ever imagine. So after finishing all but the wonky hem, I stepped away to get my bearings. Keeping in mind that this should have taken about half a day, at long last I have prevailed! 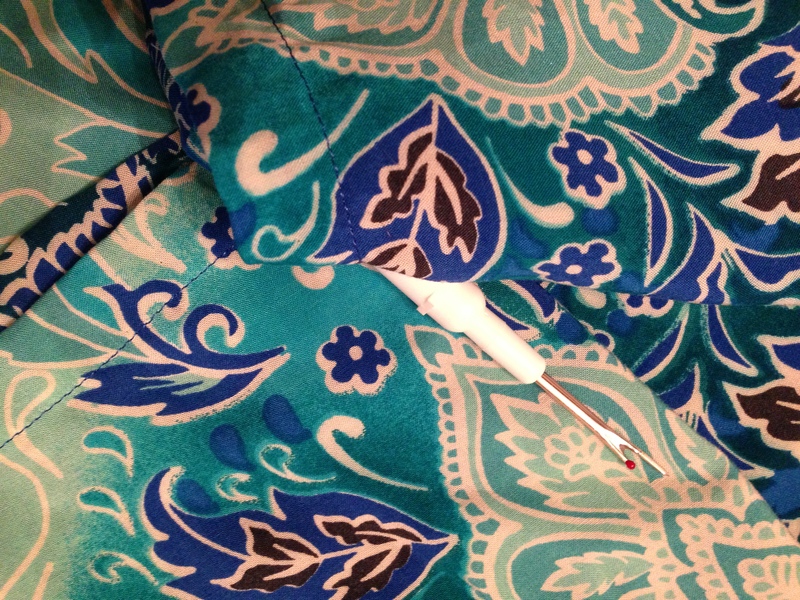 But first, look closely and you’ll see the sleeves surrounding my new best friend, Rip, the trusty seam ripper. 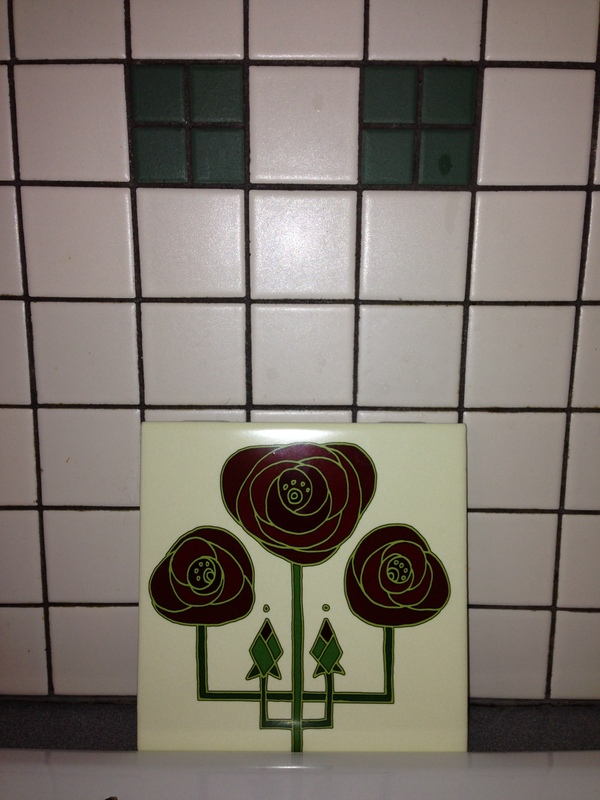 This could be a highly stylistic art piece, couldn’t it? Sleeves representing my arms/hands locked tightly to that little ripper. So profound. But I digress. Hoping to diligently snap something every day to compile my little weekly list. So without further ado, we begin! Sunday. On our way home from visiting cousins in Pennsylvania, we stopped at the annual Kutztown Folk Festival. 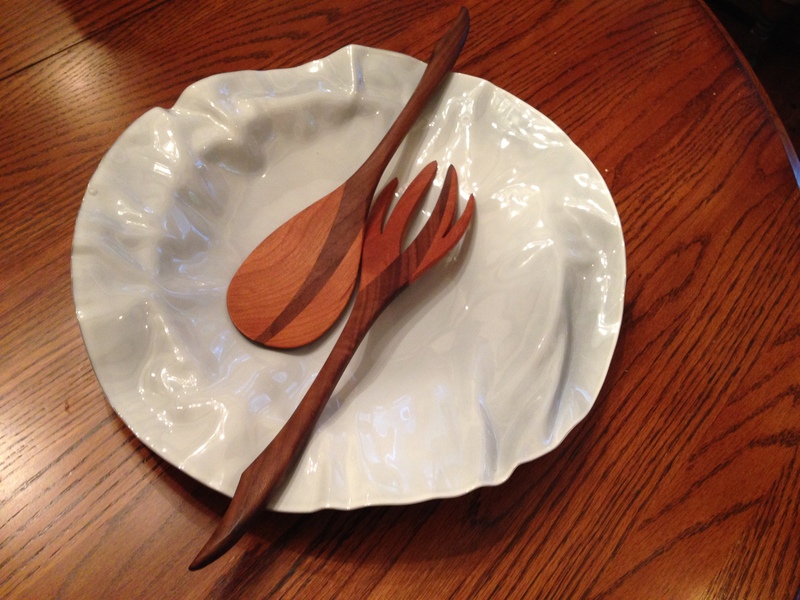 Sheep shearing, farm animals, handmade wares of all kinds, beautiful quilts, and a set of cherry wood salad servers that called out to me. 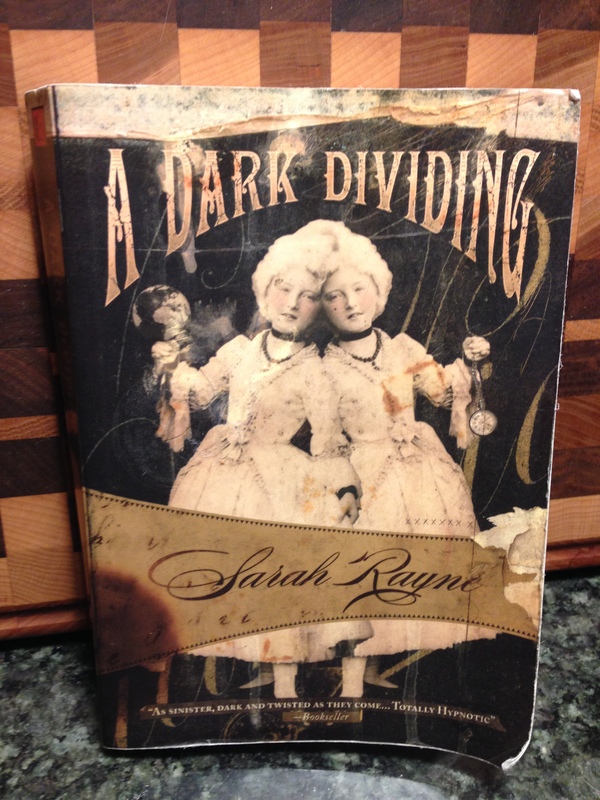 Monday: Book donated to library …. just starting it. You might guess that it’s a mystery. It involves a missing twin, the remaining twin, and a scary old mansion on the border of England and Wales. 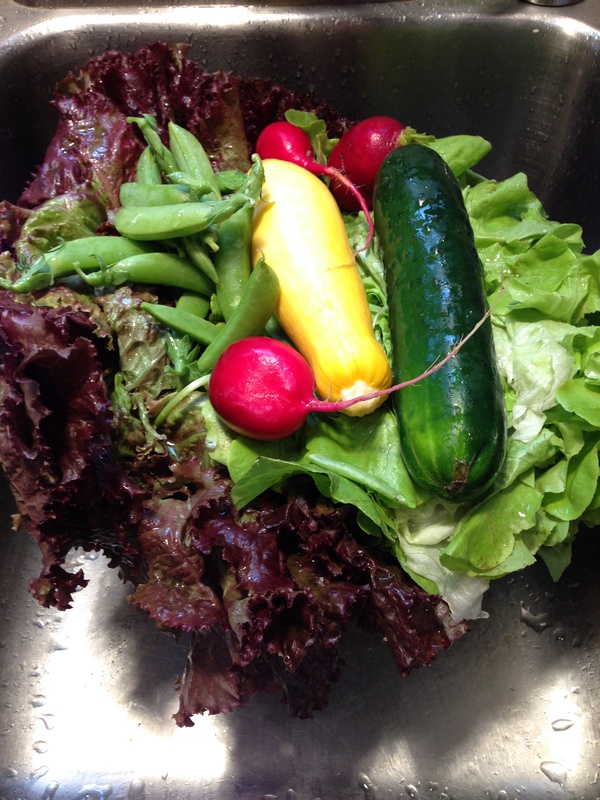 Wednesday: Neighborhood farmer’s market every Wednesday – ready for salad. Sugar snap peas! 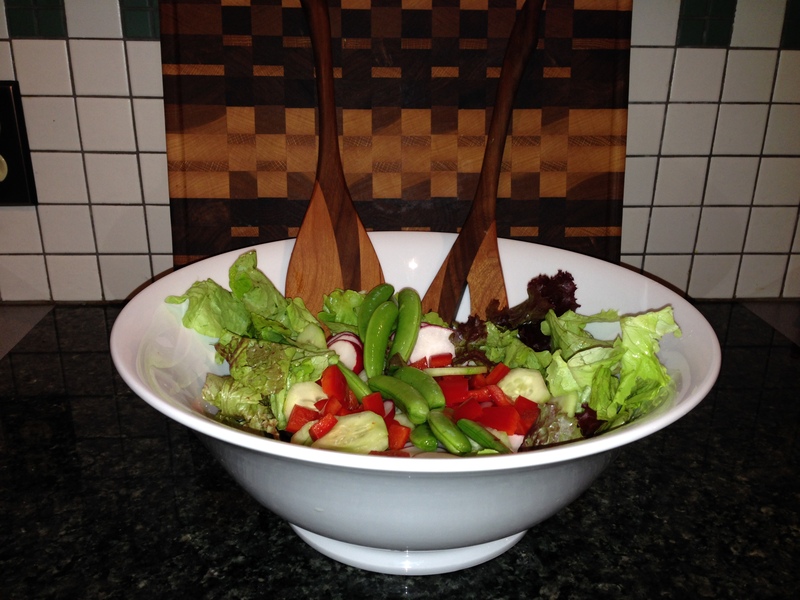 Thursday: Making use of the farmer’s market haul, and festival servers. Friday: Clearing the rug for vacuuming. 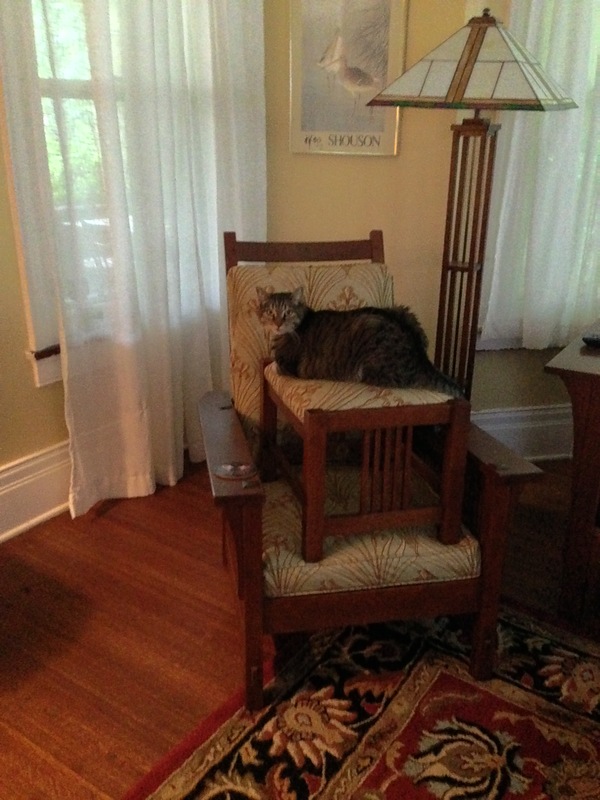 Apparently Frieda was not yet ready to give up her chair…. 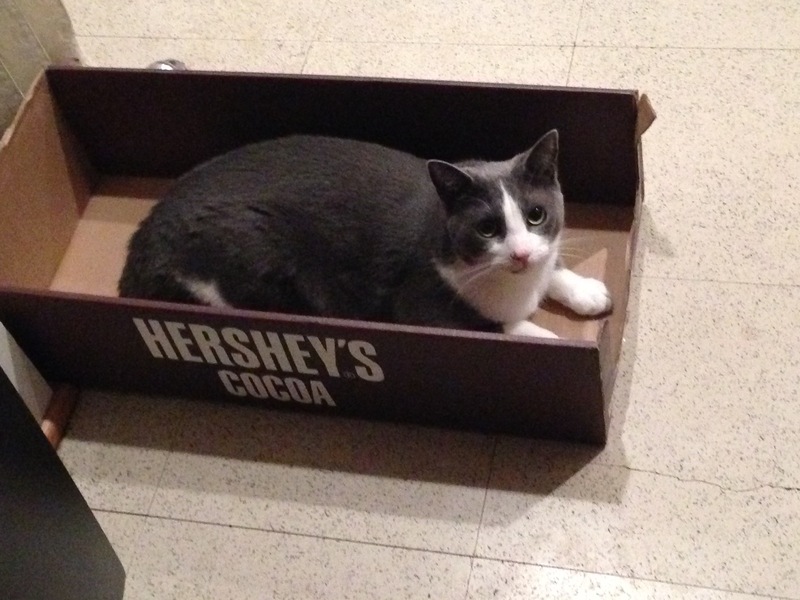 Saturday: Life is just a box of chocolates. Didn’t want to leave Jasmine out.